Step One: Gather up your ingredients. You’ll need fresh, organic lemons. Pick ones that look good and don’t have a lot of blemishes. You may choose Meyer lemons or regular ones. Wash these thoroughly. You’ll also need course sea salt. Do not use regular commercial salt as this has additives and it is too harsh for this use. 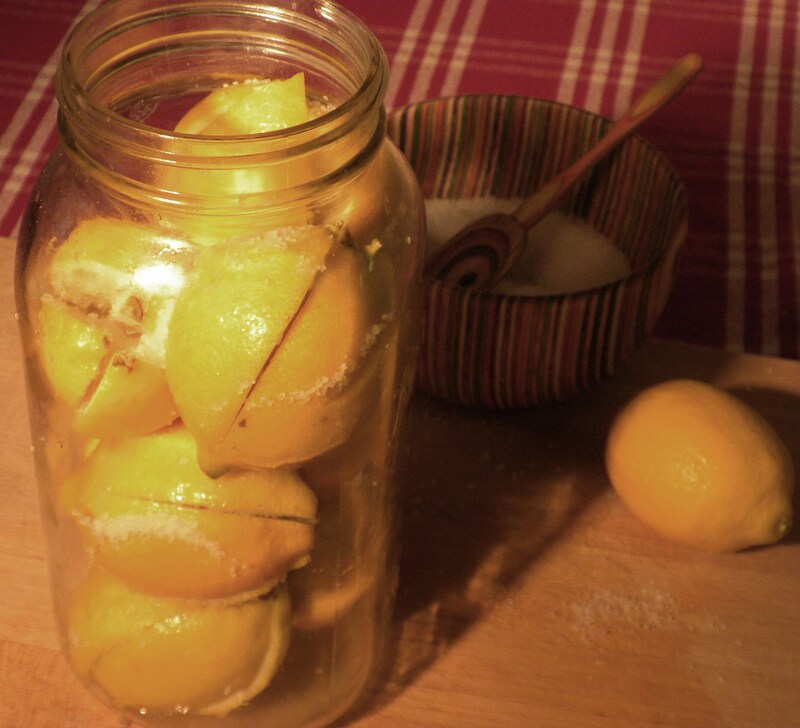 You’ll also need a clean jar in which to put your lemons while they preserve. I chose a Kerr one-quart jar with tight-fitting two piece top. You can also use the kind of jar with the rubber seal in which the lid clips on. Some recipes I saw online recommend sterilizing the jar first but most do not. 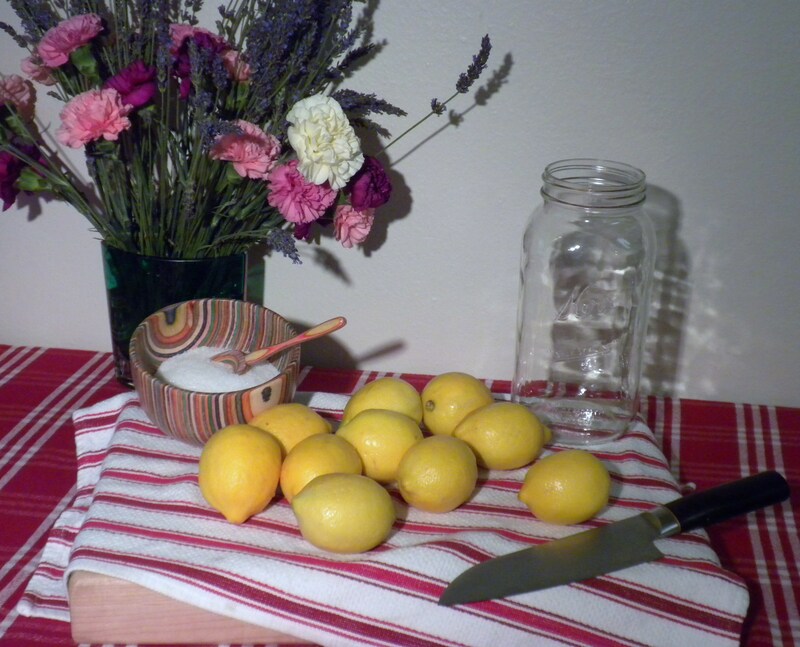 You need lemons, course sea salt, a jar and of course a good sharp knife and a cutting board. Step Two: Hold the lemons stem-side up and cut them into quarters but without going all the way through the lemon. You want to end up with a lemon that is quartered and can open like a flower, but is still all in one piece. If you have a good, sharp knife this is easy. 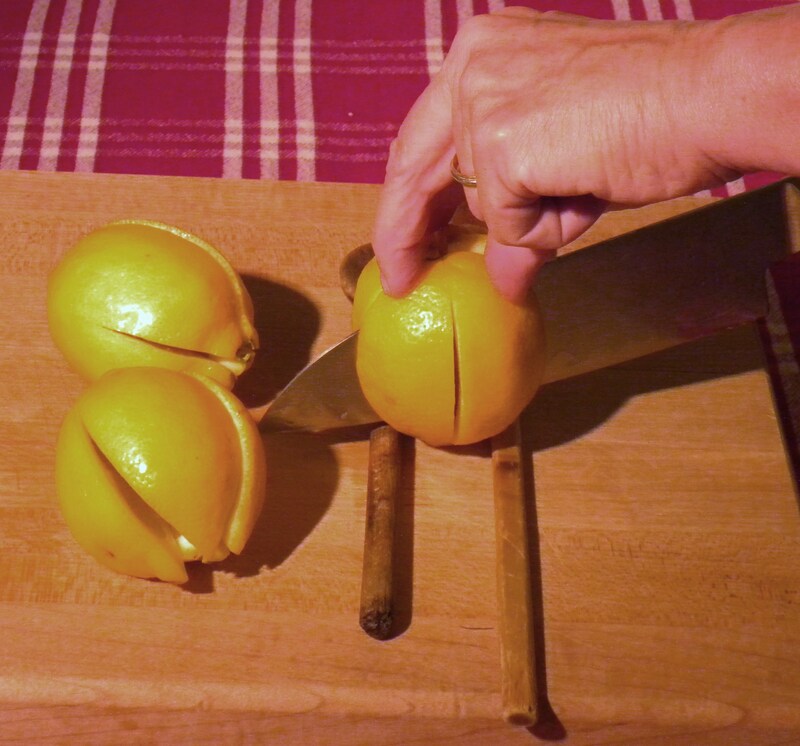 And to make it even easier, you can place the lemon between two wooden spoon handles or anything else wooden that will stop your knife from going all the way through the lemon. And, should you accidentally cut all the way through the lemon . . . no worries! Just carry on and use those pieces too. The wooden spoon handles prevent the knife from slicing all the way through. Step Three: Salt those babies! 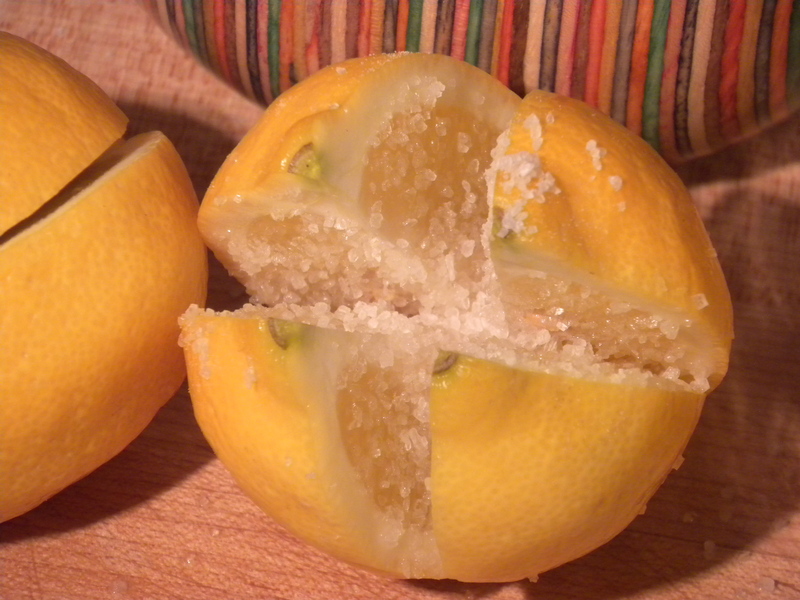 Open the lemon up and generously salt each cut surface with course sea salt. You don’t need to rub it in or do anything else to it. But, you can experiment with adding other spices and herbs to your salt and mixing them in before you salt your lemons. Hmmm, what about coriander, fennel, cloves, cinnamon stick, peppercorn, bay leaf . . .? Thoroughly salt the lemon surfaces with course sea salt. 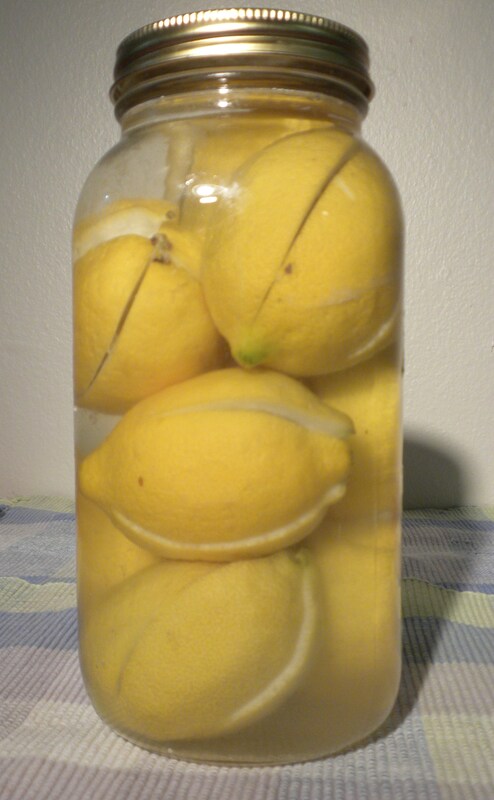 Close the lemons and pack them into the jar tightly. Add spring water, seal the lid and wait thirty days. This entry was posted in Cooking, Food, Recipes and tagged cooking without heat, lemons, Mediterranean cuisine, North African cuisine, pickling, preserved lemons, sea salt by mycookinglifebypatty. Bookmark the permalink. These look WONDERFUL! DO you just tighten the lid, or do you have to totally seal it…no heat? Just tighten the lid – no heat. I sit them on my kitchen counter for a month then put into the refrigerator for use. This is a great ingredinet to cook with but I usually buy them rather than make them. I often pair them with artichokes when I cook fish or chicken, but I like your idea of using them as a bruschetta topping. Thanks Jovina! And probably with a little olive oil mixed in! Thanks Azita! Maybe that is the secret to a popular post — just tell people it IS popular. Really? No oil? How wonderful! I love preserved lemons but have never looked into how or given them a shot. Now, i will. Hello! Yes do give it a try! It was so easy to do and I still have half a jar left. I add them to lots of things including desserts. Let me know how it turns out. Thanks for commenting, too! Haha! Thanks Brian! You’re right in the part of the world where these are probably used, aren’t you? I have found many, many uses for these. Even small slivers will brighten a dish flavor-wise and appearance-wise. Even desserts. I run into this recipe every year or two and think that I should do this. Hello Steve! So nice to hear from you. Yeah, give it a try and let me know how it turns out. I’ve never heard of preserved lemons. You did a great job of explaining this! Thanks! I can hardly wait until they’re done! These pictures are perfect for demonstration! Thanks Nick, I was happy with how they came out. Thank you Jack! I have in mind some unique applications. You can be my official taste-tester.